Oil on canvas: 12 5/8 x 24 in. 32 x 61 cm. The Church of Saint Sebastian stands on the ancient Via Appia just outside the walls of Rome seen here. It is one of the seven pilgrim churches of Rome and stands on the original burial location of the eponymous saint, whose remains were later transferred to St.Peter’s when an invasion was imminent. The elegant classical facade we see today was commissioned by Cardinal Caffarelli-Borghese from the architect Flaminio Ponzio in 1608. On the latter’s death in 1613 the church was completed by Giovanni Vasanzio. Its location on the Via Appia, and the chapel containing the relics of Saint Sebastian which had been transferred back from St.Peter’s, meant that the building was a popular destination for Grand Tourists in the 18th.century. Just up the hill to the left can be seen another favourite Grand Tour monument – the Tomb of Cecilia Metella, the daughter-in-law of Marcus Crassus who served under Julius Caesar. Around 1300 the Caetani family built a castrum or fortified camp next to the tomb, to which it is now attached. 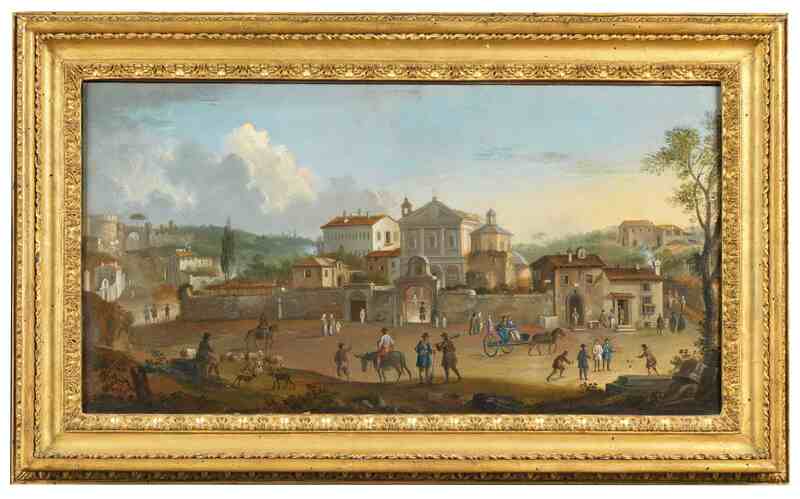 Giovanni was the son and pupil of Christian Reder, an established painter of battle scenes, who worked for much of his career for the Rospigliosi family. This family was famous for breeding horses that were sometimes engaged in urban races, as, for example, demonstrated by the Portrait of the horse ‘Capriolo’ with his jockey in the Museo di Roma (see G. Sestieri, Repertorio della Pittura Romana della fine del Seicento e del Settecento, Turin 1994, vol. I, pp. 156-57; vol. III, fig. 965). I am writing to enquire about "A View of the Church of San Sebastian outside the walls of Rome, with the Mausoleum of Cecilia Metella on a hill to the left"